The roulette gamblers can be divided into two parts: those who want to be aware of each roulette rule, its etiquette, all the possible strategies and systems and to gain as much as possible skills of the roulette experience; but there are also those, who have been already aware of all of the above factors and are bored relying on their luck or fortune and in such a way, they invent lots of tricks in order to make the game funny and profitable of course. The second group of the roulette gamblers is like magicians who are imparted by the highest sharpness, wit and theater skills which can convert each game into the most surprised and inventive performances, that even the same dealers will be open-mouthed while recognizing their tricks, but later, after the successfully done fraud during which they have robbed the house. Usually such roulette cheaters use the method of tricks which is called - past posting. The roulette past posting is a situation during which the gamblers usually replace the chips that don't get anything to those which are winning at the last moment when the successful number is announced. Or it can involve the situation during which to the winning numbers more chips are added, in order to make bigger the general winnings. The trick consists of the greatest deftness of the hands movements as well as the monitoring of the dealers gestures, because a split-second decides everything in this performance. 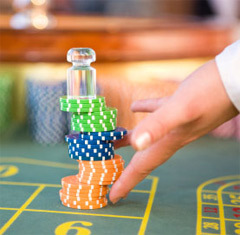 The most convenient position to do all this is the end of the table or just the further location from both roulette wheels and dealer. In general in the past posting distraction must be approximately 4 persons of one luxurious woman to distract, a bet man, "claimer" and "mechanic". The somewhat distraction of the croupier also needs previous rehearsal or something like this: it must be some question of an advice, or just repeated questioning. Then the woman or somebody else can begin the cheating performance during which she bends down the table pretending that she's looking for the chips or something else. Also what is needed in this kind of cheating is great eyesight due to which you will catch the winning number at the necessary moment. Moreover the right replacement of the chips the cheater has to do in such a way that not to be caught completely. Each type has the common purpose to distract the dealer and to gain the winning chips and numbers. Now this kind of roulette swindling is considered to be very dangerous, first of all it's illegal and the introduced cameras can lead everybody to jail not taking into the consideration any of the fake cheating improvisations. So, if you ever would like to imagine yourself like a member of a cool band, think a little bit if you are imparted by that kind of wisdom, experience and invisibility.